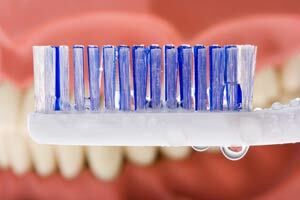 Dentures should be brushed inside and outside daily with a soft, toothbrush or denture brush with round-ended bristles. Use dishwashing liquid to cleanse your denture instead of toothpastes, which are too abrasive and will scratch your denture. Rinse with cold water. Inspect your denture for small stress lines. When not in use,store dentures out of the reach of any pets. They tend to chew them. Most dental insurance policies provide coverage for new dentures every 5-10 years.